It's a beautiful collection of garments and well worth a look. If only for the tights/shoes combo on the front cover. I loved this - could I knit it? Possibly with lots of encouragement. Could I breathe in long enough to wear it? I don't think so. I've been contiuing with my knitting and completed two,(two I tell you ) hot water bottle covers. I'm pleased to have completed them at all as I'm very good at starting and not so good at finishing. 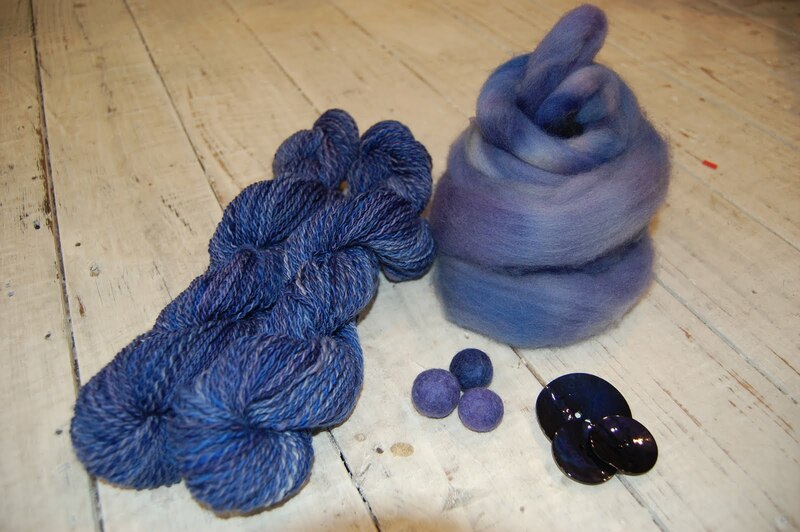 My next project I think is going to be a blanket and so I checked the colours due in for Autumn/Winter and dyed some fibres in midnight blues and lilacs. My wheel, which is lumped about with little regard for it's welfare has finally put its foot down and is complaining by not drafting in no matter what I fix or fasten. So this wool is not the best I've ever spun but as I'm going to knit it myself I'm not overly concerned. I'm happy with the shades though. Here's the fibres, with the spun yarn and also a couple of felt balls just for good measure. We visited Fibre & Clay in Knutsford which is a wonderful yarn/gallery and well worth a visit. These midnight blue buttons were crying out to be used with this yarn so we'll see what we can do. I had planned to keep this yarn for myself but it seems to have already been nabbed! There are new knitting boxes posted on my etsy shop in case your needles and notions are all over the place. They are beautifully made by a local craftsman who supplies wooden items that we sell in the shop. We're really pleased with them and hope they go to a knitter who will take good care as they have been so well made they deserve a good home! As well as all this, we've got niddy noddys and lazykates on offer, so have a good look.